Eco Friendly Archives « Breastfeed.Babywear.ClothDiaper.Naturally! Breastfeed.Babywear.ClothDiaper.Naturally! It is not uncommon for me to fold a receiving blanket or two on a weekly basis while doing laundry. My children are toddlers, but we still find regular opportunities to reuse those blankets. Receiving blankets are a safe and common baby shower gift. Everyone needs them, right? I had a whole drawer full and never really knew what to do with them all, but I had a difficult time getting rid of them. Over the years, they have served many purposes in my home. These are ways to use all those receiving blankets! To clean up liquids ranging from baby spit up to toddler potty training accidents. As wash cloths. Cut up a receiving blanket to get over 20 individual washcloths. I kept them in my diaper bag and in my kitchen to clean little mouths and hands after meals. As wipes. 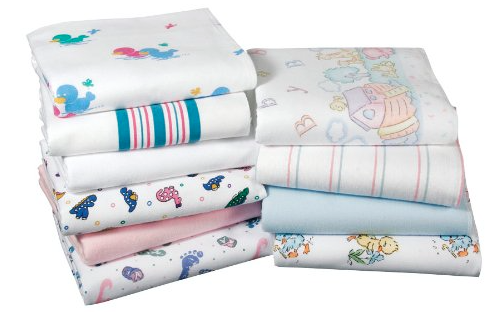 When my kids had bad diaper rashes, I cleaned them with water and small pieces of a receiving blanket. In an emergency. I keep a receiving blanket in each vehicle in case we have a spill in a car, a child gets wet or muddy while we are out playing, or if someone wants a blanket during a car seat nap. As a floor mat. I notice many moms of infants who bring receiving blankets to story time at the library for their infants to lay on or sit on. As wrapping paper for a baby gift. This is a fun way to pass them on to another mom who may or may not need more receiving blankets in her life. Use them for teething babies. Cut into squares and wet a corner of the cloth and put it in the freezer. Baby will love chewing on the cold cloth. Make a quilt or a stuffed animal out of pieces of your favorite receiving blankets. Sarah Cole is a stay at home mom of two busy toddlers who actually wishes she didn’t get rid of most of her receiving blankets. The use of plastic is a hot topic these days. Many argue against its effects on people who work in the factories, the footprint it leaves in our oceans and landfills, and the level of waste that is encouraged with such accessibility to cheap plastic materials. Living sustainably and eco-friendly does not require that all plastic be removed from your life necessarily. Still, you may be looking to use more sustainable products overall in your kitchen. Perhaps you are concerned about BPA, PVS, phthalates, lead, and BPS, among other substances within plastic. I notice a difference in taste as plastic seems to hold on to past smells and flavors in a way that other options do not. Plastics may scratch and show other signs of wear like shifting shape just enough to make placing the lid on difficult or impossible. If this is you, consider a few other options the next time you look to purchase reusable containers. Glass. Glass is a go-to in our house for fridge, counter, and pantry storage. Some glass is more easily breakable, so look for pure, tempered glass if durability against dropping is a concern for you. Wean Green and Life Factory are favorites of ours for that reason. Pyrex, Anchor Hocking, and Ball and Kerr jars (though generally not tempered) are also US made and easy to find relatively inexpensive in your local grocery or box store. Note that some glass brands still use plastic for part or all of their lids. Some of these options, like Ball or Kerr glass jars, can multi-purpose for canning as well. Just as with any storage you have to be thoughtful, but especially with glass in the freezer as it can crack if the contents expand upon freezing. Recycled plastics. 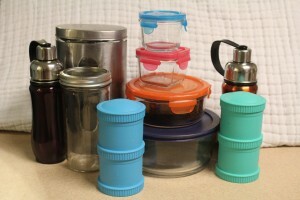 Depending on your reason for avoiding Tupperware you may be open to continuing to use plastics. 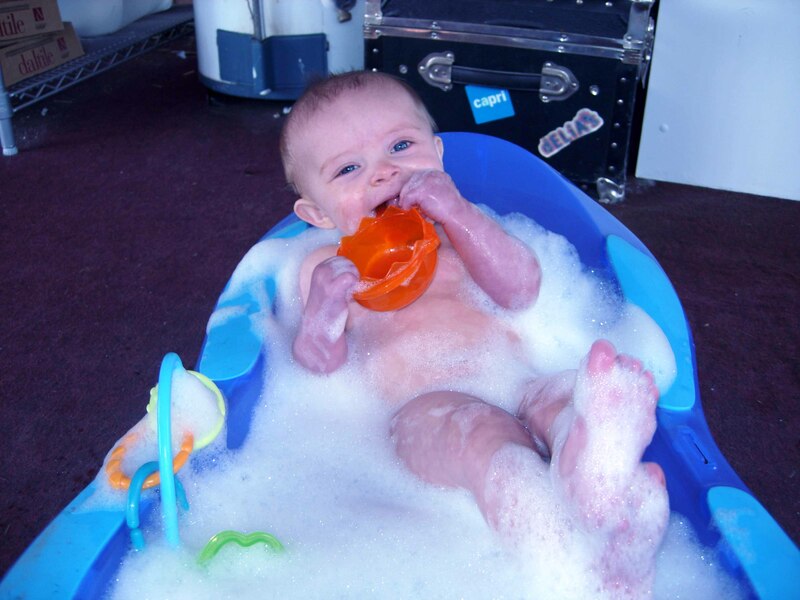 Re-Play offers cups, plates, bowls, utensils, and even teething rings made from recycled plastics (notably milk jugs). They are dishwasher, but not microwave, safe. They still contribute to sustainability due to their recycled nature and can sometimes be more kid-friendly than glass alternatives. Silicone. I enjoy that silicone (and glass) don’t hold stains and smells the way plastic can (think tomato sauce). Silicone is generally microwave safe as well. Oogaa bowls are our go-to for kids meals and they love the fun designs once they get to the bottom of the bowl. EzPz is another brand that offers stainless and durable silicone options that any kid will like. Stainless steel. This works great for water bottles as well as general food storage. Pura, Kleen Kanteen, and Think Baby/Think Sport are popular brands. If plastic is a deal-breaker for you note that some stainless steel constructions still utilize plastic for lids, especially with water bottles. We also have stainless steel and glass containers in our kitchen to store a variety of things including coffee, nuts, crackers, cereal, spices, and more. Reusable bags. These bags may be made of any number of materials from cotton and hemp to other food-safe plastic-like alternatives. Planet Wise makes a variety of bag styles (from Velcro to zipped and some with a see-through side) to meet a variety of needs, especially for packing lunches! Once you begin minimizing your use of plastic in your kitchenware you may find yourself thinking of other ways to lessening your plastic consumption. You can utilize bamboo utensils and cutting boards rather than plastic options. Using reusable shopping bags or covering your bowls with a large plate or reusable covers instead of cling wrap are small ways to continue toward minimizing consumption. As a mom of two toddlers, we go through a lot of snacks. My kids love the traditional snacks of goldfish, dry cereal, animal crackers, pretzels, etc. 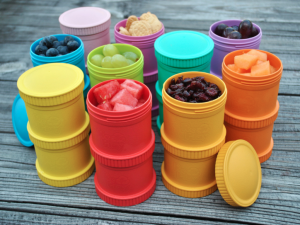 I am always looking for the best bowls, cups, and sippy cups to use for snack time and when we are on the go. I recently started purchasing Re-Play brand products from Mom’s Milk Boutique. Let me just say, I have met my toddler’s snacks BFF! Here are some of the amazing and functional products offered from Re-Play. Sippy Cups: These hard spout cups are spill proof, and I mean it. We’ve been using these cups for several months, and I have yet to have an issue. They go in my bag easily, too. They are made from recycled milk jugs and fit perfectly in a toddler’s tiny hands. They come with a silicone valve and are easy to throw into the dishwasher when dirty. Soft-Spout Cups: These cups hold 10 ounces and are for 9 months and up. My son Levi loves these! The colors are bright and cheery. We have green and purple. No leaks, either. These would be a good option for a baby transitioning from bottle to cup. Bowls and Plates: The plates have 3 sections divided so you can put different foods on them for your little one. The bowls are perfect for cereal, snacks, or even side dishes at dinner. I wish I had a cabinet full of these plates and bowls. The quality is better than any we have bought at local stores. Snack Stacks: These are perfect for snack time on-the-go or at home. They work great for snacking toddlers and you can add them on top of each other as you get more. They are made from recycled milk jugs like the other Re-play products and also come in bright colors. No more baggies in my purse or containers that spill Cheerios everywhere. Have you tried Re-Play products? If not, I highly recommend you give them a try. They are good for your toddler and good for the environment. You won’t be disappointed. Karyn Meyerhoff is a mom of two in Northeast Indiana who is a big fan of products that don’t leak and spill in her diaper bag. It’s hot outside and we’re starting to enjoy some outdoor fun! That means that little hands are getting all sorts of dirt on them and then probably making their way straight into their little mouths. Many conventional hand sanitizers contain some pretty scary ingredients that you don’t want anywhere near your child’s mouth. Luckily, making your own hand sanitizer is simple, and all you need are a few easy to find ingredients. Aloe Vera makes a great base for a hand sanitizer. It gives you the gel-like feel of conventional products and has both antibacterial and antifungal properties. Witch Hazel is an optional ingredient, which works as an antiseptic thanks to its alcohol content. Its alcohol concentration isn’t as strong as the alcohol concentration found in store-bought sanitizers, and it can even be left out all together if you want. Essential oils give this concoction most of its antibacterial benefits, so you’ll want to stick with powerful ones. Tea tree oil is known for killing bacteria and fungus, and as an antimicrobial, it should always make up the largest part of your essential oil. You can add more essential oils to either add more germ-fighting ingredients (lavender, clove and rosemary are good choices) or just to add a nice smell (citrus, cinnamon and peppermint oils add a fresh scent). A touch of vitamin E oil helps preserve shelf life so you can keep it for a few months. Here is a simple recipe you can pour into your own squirt bottle. When we buy baby products and see labels claiming safety for our loved ones, we want to believe that they really are safe. Unfortunately there are many ingredients in common baby products, even those labeled natural or organic, which may actually be hazardous. Phthalates are a man-made chemical typically used to make plastics flexible. They are also used in many fragrance oils since they prolong the scent and are commonly found in lotions, powders and shampoos. They have been linked to hormonal changes, birth defects, reproductive abnormalities in baby boys, and damage to the lungs, liver and kidneys. A study conducted by the American Academy of Pediatrics found that even young infants frequently exposed to phthalates are vulnerable to these adverse effects. Parabens are often used as a preservative that prevents the growth of bacteria, mold, and yeast in cosmetics, foods and pharmaceutical products. They can be found most commonly in deodorant, shampoo, conditioner, lotions and shower cleansers. Parabens mimic the hormone estrogen and, according to the Breast Cancer Fund, have been linked to breast cancer after being absorbed through the skin. Perfumes give many products their lovely baby smell but it’s really nothing more than a mix of chemicals trying to cover up the smell of even more chemicals. Artificial fragrances are known for being one of the top five allergens and a frequent trigger for asthma. Unfortunately the fragrance industry is allowed to regulate itself so they are allowed to determine what is safe without an outside agency to test for safety. Always be sure to read labels and avoid these ingredients whenever you can. Since there are so many other chemicals being used in baby care products your best bet is to choose products with an ingredient list you can pronounce. Your next best option is to search the Environmental Working Groups website Skin Deep which lets you search for safe products or type in a product and find out how it ranks for safety against toxic chemicals.